Home Lesley Roy is a singer from Ireland. 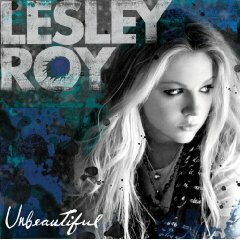 I was first told about Lesley Roy back in 2007 and now finally in 2008 she has released her debut album "Unbeautiful" in September 2008. 8 Ana Johnsson Well done to Lesley and all involved for this fantastic album! 11 Artister of Amnesty 1. I'm Gone I'm Going Written by L. Roy/M. Martin/J. Schuster/A. Kronlund. Produced by Max Martin for Maratone Productions. 13 Avril Lavigne 3. Slow Goodbye Written by L. Roy/M. Martin/L. Gottwald/K. Perry. Produced by Max Martin for Maratone Productions and Dr Luke. 14 Backstreet Boys 4. Unbeautiful Written by L. Roy/M. Martin/R. Yacoub. Produced by Max Martin and Rami for Maratone Productions. 20 Bullet For My Valentine 10. Make It Right Written by L. Roy/M. Allan/D. Hodges. Produced by Mitch Allan and David Hodges. 25 Cervello Johan Schuster is Shellback and also co-wrote Pink's "So What". 28 Cyndi Lauper Kara Dioguardi has written songs for Kelly Clarkson, Celine Dion, Britney Spears, Avril Lavigne and more! 32 Def Leppard I don't know much about Camela Leierth, per Wikipedia she is the female voice on Kent's "Generation Ex". 33 Drain Desmond Child has written about a million hits. I would guess his biggest hit is Bon Jovi's "Livin' On A Prayer". http://www.desmondchild.com/. 36 Emblem3 Desmond Child and Andreas Carlsson have recently written songs for Ace Young. 37 Enrique Iglesias I think E. Taubenfield is Evan Taubenfeld - Avril Lavigne's guitarist. http://www.myspace.com/evanmusic. I could be wrong though. 45 Its Alive Emanuel Kiriakou and Lindy Robbins also co-wrote (with Jess Cates) Backstreet Boys' "Inconsolable" and Nick Lachey's "What's Left Of Me"
50 Kahsay Will Hunt is a drummer and used to be in Evanescence. 69 Nicki Minaj This has to be a hit!